Chris Miller, 49, Encinitas, CA. Where are you from and what got you into skating? My family used to live in Santa Monica, Ca which is where I first found skateboarding. I was a little kid, but Tony Alva, Jay Adams and the whole Dogtown crew were already legends in the skate world. After that my parents split and I moved with my mom to Claremont where I started skating at Pipeline Skatepark in Upland. This is where the real fire for skateboarding was lit. Salba really took me under his wing and showed me by example what it means to be a skateboarder. 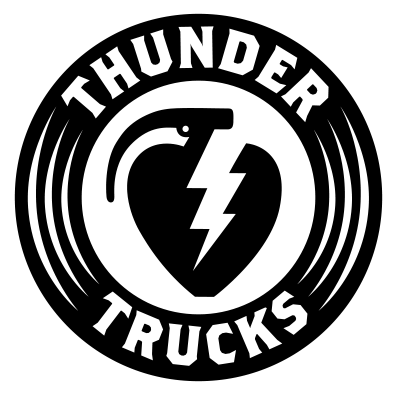 How long have you been riding Thunder Trucks? Long time… not even sure, but Thunders are the best. Where is your favorite place to skate? I mostly skate Poods Park in Encinitas these days but my favorite spot is the Vans Combi. What’s the go to after a heated session? Haggo’s or Fish 101 in Encinitas. It seems like you haven’t slowed down much over the years – Whats the secret? Yoga? Eating healthy? Not sure… but I feel fortunate for my life and skateboarding in general. Just do what you love and never stop. Yoga has been a big help in the last few years but really it’s just about balance and keeping it going. I’m only a semi healthy eater. I’m not fanatical about my health but I do try to be mindful and take care. Everything in moderation including moderation! Your son Zach Miller rides for Thunder and filmed / edited this video as well – Does he ever skate coach you? Zach is the nicest guy ever but we give each other a hard time. I was falling on a couple of these lines and he told me it’s because I’m “fat and old.” It’s pretty motivating. From your Instagram it looks like you spend a lot of time at the beach – do you surf as well or just like the beach a lot? Surf. Surf. Surf. I love it, and water is softer than concrete. Really it’s just that I usually only post nature photos, land and seascapes. That’s what inspires me and makes me feel at ease in this crazy modern world. Every once in a while I’ll repost a skate photo if one pops up but that’s about it. Working on anything new you’d like talk about? Just very thankful for the years and years of support from my sponsors. Any advice for the younger skaters out there? Be smart. Be humble. Be kind. Keep learning. Do what you love. Love what you do. Follow @thundertrucks & @owlcat for your chance to win a new set of Thunder 151 Team Hollows.